July 9, 2013 By Allyson 57 Comments This post may contain affiliate links. Read my disclosure policy. Today I have yet another quinoa recipe, because really, do they ever get old?! No way! If you haven’t jumped on the quinoa bandwagon yet, you are totally slow, but it’s never too late! While quinoa seems to be a fad food right now, it’s definitely going to stick around. It’s one of the most complete foods, and is super healthy and great for your body. It’s also so versatile and can be used in so many dishes! Don’t believe me? Check out this Buffalo Quinoa ‘Mac’ and Cheese, for a healthy spin on the traditional favorite. Or how about some Strawberry Goat Cheese Quinoa Salad as a perfect side for those summer dinners? Want more inspiration? See more quinoa recipes at the bottom of this post. In particular I really like Bob’s Red Mill Organic Whole Grain Quinoa . 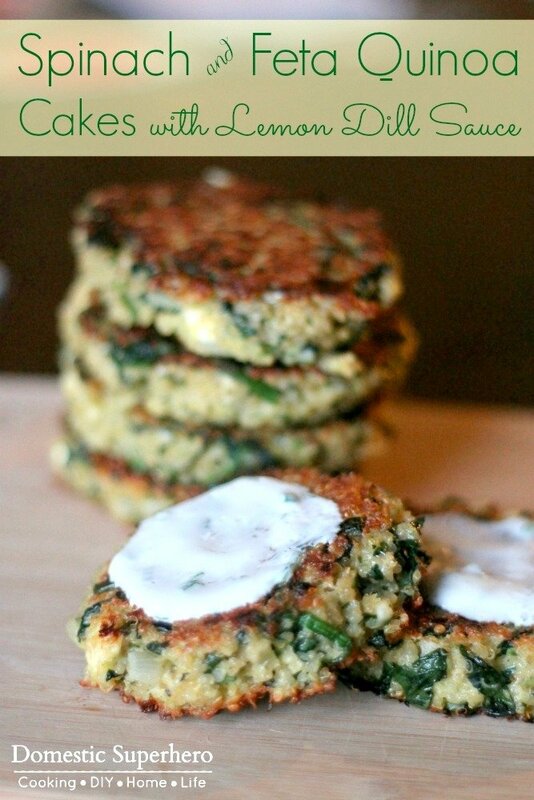 Anyway, like I said, I am going to share another quinoa recipe with you- Spinach and Feta Quinoa Cakes. I love quinoa cakes because they are quick and easy, and so filling. I have made them several different ways, but my husband agreed with me that this is one of the best recipes we have tried. The spinach and feta go perfect together (the Greek were onto something here! ), and topped with the cold lemon dill yogurt sauce, they taste amazing! These would definitely freeze up well if you wanted to make a large batch and save some for dinner another time. 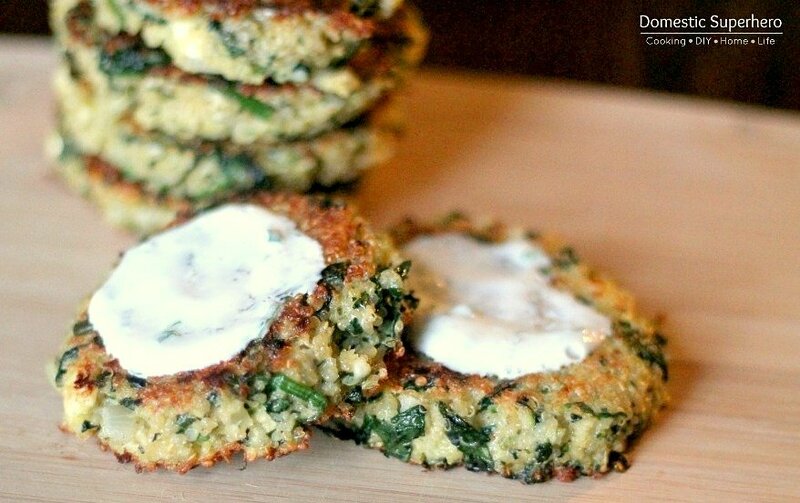 Serve these quinoa cakes alongside some roasted veggies or a heap of steamed broccoli and you have an awesome meal! Whisk together the yogurt, scallions, lemon juice, and 2 tsp dill in a small bowl. Season to taste with salt and pepper. Cover and refrigerate the sauce for at least 1 hour to allow the flavors to meld. Heat the olive oil in a large skillet over medium heat. Add the onion and garlic and cook, stirring often, until softened, about 4 minutes. Add the spinach and cook, stirring often, until wilted, about 3 minutes. Transfer the mixture to a medium-size bowl. Add the eggs, quinoa, feta, 1 TBS dill, lemon zest, and 1/4 tsp black pepper and mix well. Mix in the bread crumbs and let the mixture sit for a few minutes to allow the bread crumbs to absorb some of the moisture. Wipe out large skillet, and add 1 TBS oil. Heat for a few minutes. Form quinoa patties about 2 1/2 inches in diameter and 1/2 inch thick. Place the patties in skillet, in batches if necessary. Cook the patties until they’re browned on the outside, 4 to 5 minutes per side, and then flip. Serve warm with lemon-dill yogurt sauce. You could bake these too if you would like! Love quinoa like I do? Check out these other great quinoa recipes! 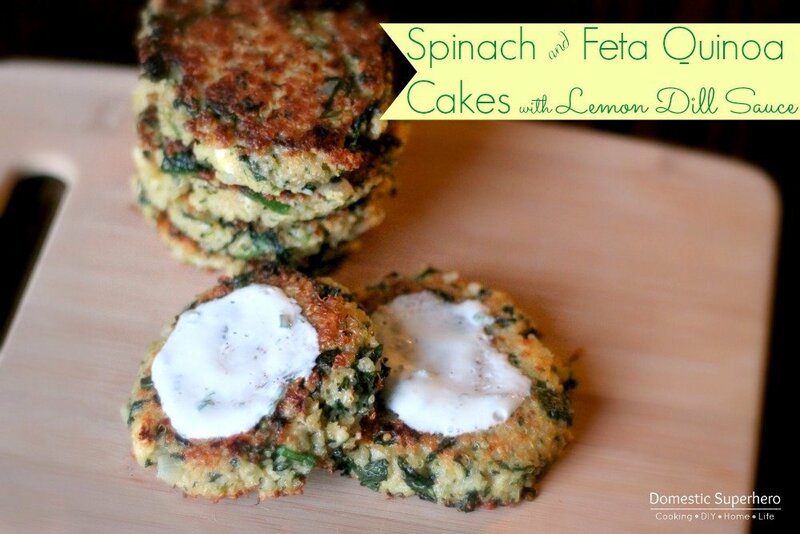 Hi Allyson, these look awesome, Pinning so my daughter can see it make them, she loves spinach! I hope she likes them!!!! I saw the photo and immediately thought, “Yummy!” Consider it pinned! 🙂 Stopping by from the Pin Me Party. These look super tasty! I already made my man look at them, too, and he agrees! You had me at “Spinach and Feta”. Wow! These look delicious! I am featuring you at Posed Perfection today from our first All Things Thursday Blog Hop. I hope you’ll be back again tonight to link up more great recipes! Have a great week. You are so sweet! 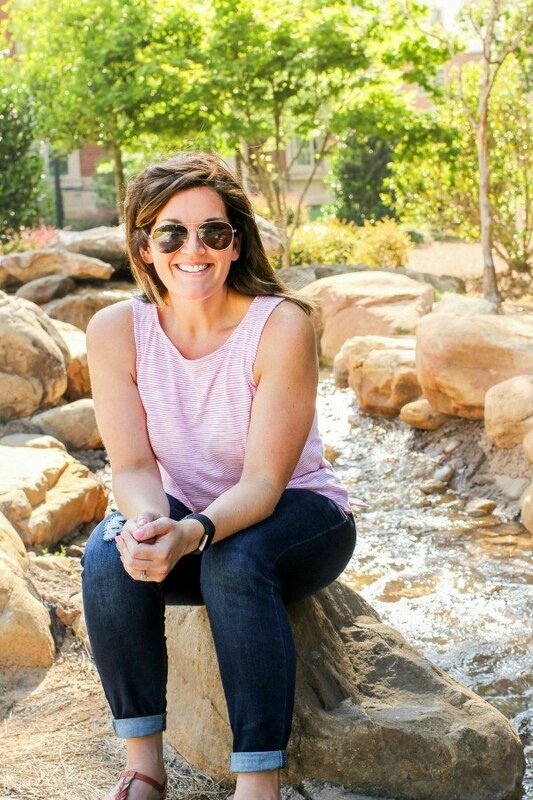 Thanks for featuring me! I will hop back over today! They are delicious! Thanks for coming by, Lori! Looks dee-lish! Thank you for sharing. Pinned. Can these be frozen and reheated? Looking for ideas to make on the weekend and have for lunches during the week. I haven’t tried it, but I don’t see why not! how can I make these without the bread crumbs? hubby has severe reaction to bread and other flour items. Can you try a gluten free ‘bread’ crumb? We have a similar issue and are going to try crushed pork rinds instead of the crumbs. Can’t wait to try these–going to sauté extra spinach with mushrooms and onions to top them, along with a poached egg, so it’s sort of like a veggie eggs benedict! Yum! Thanks for sharing this recipe, Allyson! um…”veggie” barring the pork rinds (guess I did say “sort of”). OOPS! Could also just add an extra egg. Let me know how they turn out, kathy! I hope that change makes them great for you! Use crushed corn chex in place of the bread crumbs. I use them a lot in place of panko. I made these for our dinner tonight and they were absolutely amazing!! Even my super picky kids were asking for more!! Thank you so much for the recipe. I can’t wait to make them again! I am so happy that you and your family liked them! They are a hit at our house too! Hope to see you around again! Thanks so much! They were a hit when I made them — so delicious! But what can you serve with them? I made this tonight and enjoyed it, but I made a few changes (by mistake): I used amaranth instead of quinoa, but I accidentally used too much water when cooking it, so the consistency was off. I also put 2 shallots into the dip instead of 2 tbsp… clearly it was a bad day! But they still turned out ok, and I’d try them again. Thanks for sharing! I am happy they still turned out okay! I Hope you try them again because they are delicious! If you bake them, what temperature and for how long? Thanks! I would try 400 degrees for about 30 minutes. Keep an eye on them. I would also lightly spritz the tops with olive oil spray! Just as an addition I have made these a few times now but I am getting more crafty in my endeavours and I thought I might share what I decided to add to this greatness. Tonight I decided to add sundried tomatoes and artichoke hearts to this mix. Spinach, artichoke, and feta are always an excellent mix. It is absolutely a win!!!! Wow, that sounds great! I am definitely going to try that out because I LOVE artichokes! Thanks for sharing!! When this says 1 1/4 cup cooked quinoa, is that how much to put in the pot to cook? Or how much post-cooked? For example, 1 cup of dry quinoa turns into like 2 cups once it’s cooked. It’s 1 1/4 cooked quinoa…so that is after it is cooked. You should put about 3/4 cup into the pot and cook that! We tried this tonight and it was absolutely delicious!! My son loves quinoa and we really need to try different ways of eating it. Loved the sauce too… it gives the patties an amazing Greek flair. Thank you so much! I am so happy you loved them! I love how healthy and delicious they are! I am going to add them to my meal plan this week! I am also going to share your comment on my Facebook Page! Happy new Year, Donna! Mmm! These were so good! I have never tried quinoa before and this was the perfect recipe for my first time. These were so full of flavor, the only thing I did different was to add garlic to the sauce and omitted the onions in the cakes. They were still amazing and I would definitely make these again. Thanks for the recipe! These are perfect for quinoa first time! So happy you loved them! These are terrific! I have made them several times. I’ve also made ahead, then served cold as part of a cheese/fruit/nut appetizer platter. I have made them both with dill and with Italian parsley. Yum yum! I love these too! So glad they have become a staple in your home! What a creative way to use quinoa. These look great! I love recipes that make use of dill in tasty ways. Can’t wait to try this one at home! Billy, you will LOVE it! Please report back when you try it out!